Great style, great features! 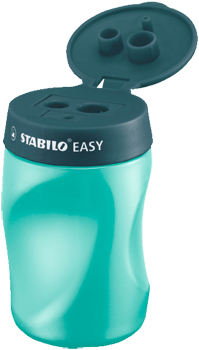 The ergonomic STABILO EASYsharpener can accommodate three different lead diameters. 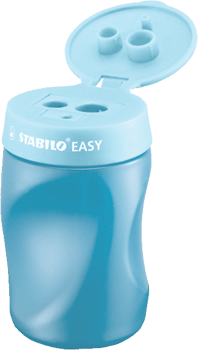 The STABILO EASYsharpener is the perfect complement to the EASYcolors, EASYgraph and EASYergo 3.15 and all thin wooden pencils. Available for both left and right-handers, it can sharpen three different lead diameters. Designed for pre-school children aged 5 and over, the colorful designs will brighten up any pencil case. The STABILO EASYsharpener can accommodate three different lead diameters. EASYcolors, EASYgraph, EASYergo 3.15 and most of all thin and thick wooden pencils can all be sharpened. The version for left-handers comes in petrol, pink and blue. The version for right-handers comes additionally in the colors orange and green. It has an ergonomic design and there are versions for left or right-handers. Beyond functionality and design lies much science and care. The innovative moulded grip makes it comfortable for the smallest hands. 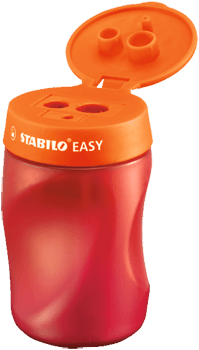 It has a closable lid and a safety screw to prevent injuries. There is a name tag space, too. STABILO EASY sharpener comes in 3 color combinations for left-handers and 5 color combinations for right-handers.